The President is the highest and single most-powerful official in our system of government. We may have co-equal branches of government, but the President is on top, both as Head of Government and Head of State. The President is the Chief Executive: appoints his alter-egos to the cabinet who lead agencies in the performance of their mandates; proposes to Congress the annual budget and his top-priority bills; and duty-bound to execute the law. The President is also the Commander-in-Chief of all the armed forces: appoints all the generals, bestows the highest commendations, and duty-bound to protect the safety of citizens and the country’s territory and sovereignty. The President also architect of foreign policy: names all our ambassadors, is duty-bound to promote the national interest and the security of citizens living, working or traveling abroad. The President also appoints all members of the Supreme Court and of the constitutional commissions. He could also commute sentences, grant pardon, name national artists, form new offices, and declare special holidays. The people, through the Constitution, gave the President these enormous powers, titles, prerogatives, and responsibilities. We need to remind ourselves of these as we pass judgment on the sixth and, very fortunately, last State of the Nation Address of President BS Aquino and his performance of his duties since June 30, 2010. 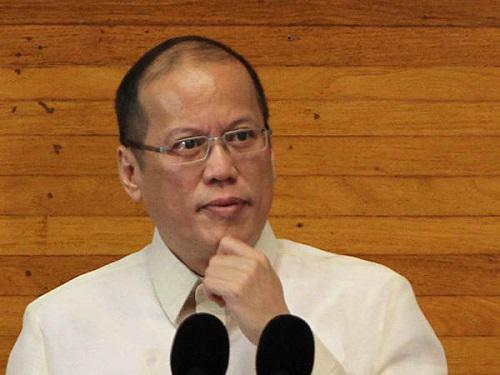 Aquino came to office on the crest of an election victory premised on the promise of good governance: “Daang Matuwid” and “Kung walang corrupt, walang mahirap.” He also came to office armed with strong, pro-administration majorities in both houses of Congress. As we near the end of his presidency, there should be no hesitation that he has miserably failed to deliver on his promise, and that the premise is a big scam that ought to be rejected. For the majority of working people, the middle class, and entrepreneurs, there has been no relief. Only unremitting sacrifices, high taxes, low wages and stagnant salaries, regulations that restrict entrepreneurship, and the breakdown of essential services. The situation for farmers and workers is much worse. They wonder each time the Aquino government announces glowing economic breakthroughs whether they living in the same country or the government is high on some awesome kind of weed. There is no one from the ranks of the working poor, middle class, and entrepreneurs who could honestly and credibly say that their lives have profoundly improved from 2010 to 2015. There may be some bright spots, here and there, but those are exceptions. We celebrate with them, but they don’t and cannot represent the majority. Meanwhile, Big Landlords and Big Business are happy, especially with the nearly P1-trillion in public funding, public subsidies, and public guarantees on their private projects. Yes, the PPPs which President BS Aquino promised would not cost the citizens a single peso. There’s no better example of this than the MRT. President BS Aquino has allowed billions of pesos to continue to be paid to the MRT Corporation for the lease of its old, outdated, and inadequate train system. Undeterred by the disastrous MRT deal, the Aquino government signed yet another agreement with the Pangilinan-Ayala group for LRT1 — with hundreds of millions of pesos in public funds set aside for the deal, on top of many perks like tax exemptions. He also promoted and has defended the unwarranted fare hikes for both the MRT and LRT1. If President BS Aquino successfully pulled the levers of Congress to cause the impeachment, trial, conviction, and removal of a Chief Justice solely on the basis of an incomplete SALN, his administration has deliberately protected his closest allies from prosecution for much worse offenses. Whether it is Florencio Abad, the architect of the unconstituonal presidential pork barrel, or his partymates who gorged on congressional pork, or his BFF Alan Purisima, the anti-corruption battle goes to a standstill. His anti-corruption campaign is so highly selective and politically motivated that it fits the mold of how traditional politicians fight corruption and not transformative at all. It is in direct opposition to the call of the Million People March which is simple and straightforward: Lahat ng sangkot, dapat managot. Actually, the people now want change. Not change under Aquino, because five years is more than enough to prove that he cannot competently and credibly deliver it in meaningful doses. But change away from what Aquino has stood for and how: A change that would benefit the working poor, the middle class, and entrepreneurs. The imperative now is for citizens to change the conversation, away from the hallucinations and self-congratulations of Aquino, his spin doctors, and his trolls. That change in conversation should expose Aquino’s elitism, incompetence, and demagoguery, while at the same time win for us some doses of relief. The change in conversation will also be important as the nation faces a stark choice in May, 2016. Are we going to fall for President BS Aquino’s attempt to prolong our national nightmare by electing his anointed one? Must we not demand from Grace Poe, Jejomar Binay, Rody Duterte, Miriam Defensor Santiago, and other aspirants what kind of change they are committed to? Must we not demand something new and better? We should learn from the long, harrowing nightmare from 2010 up to the present. A wise friend said it best: It is not so much what BS Aquino did. More about how he did it. We need and must demand substantive change, no less. No to another presidency engaged in double-talk, plagued by incompetence, favoring only a few, and an intolerable burden to the majority. 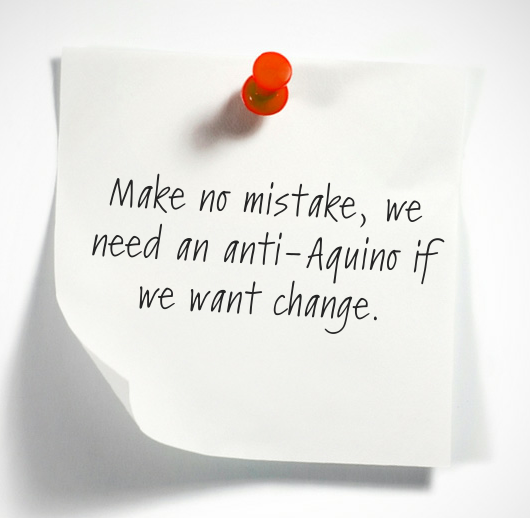 Make no mistake, we need an anti-Aquino if we want change. Epilogue: Ilusyon by ABRA ft. Arci Munoz of Philia. Published in the Manila Bulletin on 28 July 2015. Epilogue added to this repost.